Realogics' FutureCast Forum sparks conversation about Seattle and Bellevue’s trajectory into 2020 and beyond. On September 26th more than 400 registered guests joined industry thought-leaders during BISNOW's 2017 “State of the Market” Event held at the Westin Hotel in downtown Seattle. The first panel included Ada Healy of Vulcan Real Estate, Martin Selig of Martin Selig Real Estate, Tom Alberg of Madrona Venture Group and was moderated by John Hempelmann of Cairncross & Hempelmann. The second panel, moderated by Dean Jones, Principal of Realogics, Inc. and CEO of Realogics Sotheby’s International Realty, comprised of Jennifer Foschler of O’Connor Consulting Group, Brenda Gage of JayMarc Homes, Trevor Bennett of Caliber Home Loans, Christian Chan of Burrard Group and Brian Evans of Madrona Financial Advisors. 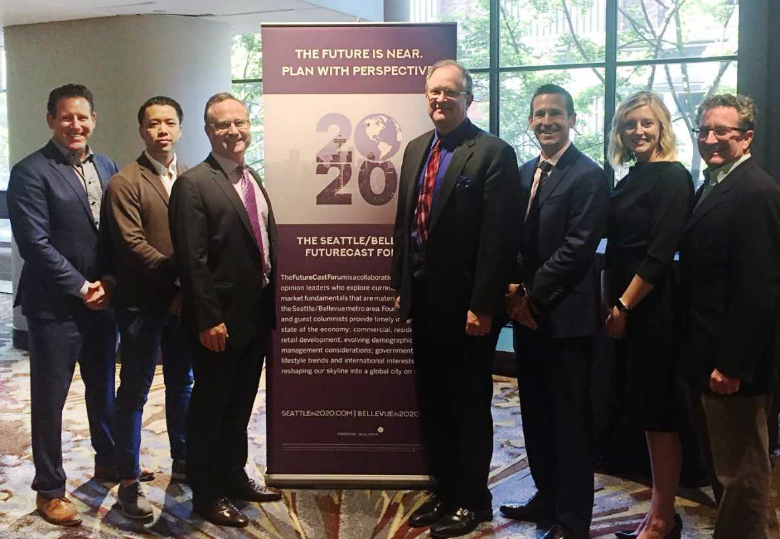 The BISNOW platform was a timely opportunity for Realogics, Inc. to launch The FutureCast Forum, described as a collaboration of stakeholders to explore the current and projected market fundamentals and trends influencing the Seattle/Bellevue metro area by 2020 and beyond. Its founding members and guest columnists will provide industry insights on the state of the economy, commercial and residential development, evolving demographics, wealth management considerations, government policy, lifestyle pursuits and international catalysts that are shaping the regional landscape. Jones launched the beta website at www.Seattlein2020.com and announced an encore discussion panel to be held on Thursday, September 28 in downtown Seattle – prospective guests are welcome to register for more information at www.Seattle2020VIP.com. The Puget Sound region is home to meteoric job and population growth, which is placing significant pressure on the housing market and resulting in the fastest-rising median home prices in the nation. Will demand outstrip supply? In a city that spawned Nordstrom and Amazon, there’s clearly no lack of retail leadership in the global economy, but is there more in store? Plenty of brands and innovative developments are making their way here. The Seattle/Bellevue metro area has been, historically, a late-bloomer economically, and the same holds true with policy-making. Are we following in the footsteps of other more established metro municipalities, and is that a good thing or a bad thing? Remarkably, the Seattle area twice voted down a major transportation plan in the late 1960s and early 1970s, when the Feds were willing to share the infrastructure – today we have a relatively small-town infrastructure with big-city needs. So where are we really going? Jobs, population and housing, oh my! Our Emerald City is witness to a tornado of development and market dynamics that are changing so quickly it’ll make your head spin. Where does this yellow brick road lead, anyway? When was the last time you saw tower cranes in downtown Seattle, Bellevue, Kirkland, Renton, the University District, West Seattle, Ballard and Greenlake all at the same time? Exactly – urbanization is real! What is up with downtown? Many of the region’s close-knit communities have experienced a renaissance of redevelopment and custom home building is on the rise. Preferred schools, commute times and spirit of place are driving the trends. What's going on beyond the gates? Living in the Puget Sound region has so many rewards, so it’s no wonder we’re being discovered by new residents on a daily basis. Whether planning dinner or the next chapter of life, to enjoy the best of the Pacific Northwest lifestyle, it’s best to get on an insider’s flightpath. Who should we look to? Economic prosperity, international influences and a pursuit of affordability in the fastest-rising home and commercial market in the US are just a few influences that are challenging the status-quo for all property types and price-points. What's new and how is it shaping the design industry as we know it? The Pacific Northwest has become a top market of equity placement and economic growth for many reasons including meteoric job and population growth, favorable tax policies (for now) and a perfect storm of economic fundamentals (for now). How do we read these trade winds? The Seattle/Bellevue area went from a fly-over city to a global destination for immigration, education and investment by foreign nationals. As the closest mainland port to Asia and a relative bargain compared to other West Coast cities, the Puget Sound region is on the map – why? There are trillions of dollars migrating between the generations in a great liquidation event that takes place as Baby Boomers become retirees and Millennials grab the reigns as the next stewards our regional economy. How do we invest in a greater perspective? Following the credit crunch of the Great Recession and a bounty of new regulations, the mortgage lending industry has been witness to dramatic reform. Yet, interest rates remain at historic lows and innovative products and processes have made applying for and securing a mortgage more accessible. What’s trending in lending? Real estate fundamentals, the sharing economy and social trending is changing how and where we work. Executives today want to work smarter not harder to get ahead. As the Seattle/Bellevue metro area grows, are all offices created equal? Each quarter the FutureCast Forum members review the many thoughts and articles submitted to rank the top ten most influential or notable findings on a particular topic. These top ten lists provide a quick reference point to what’s trending at the FutureCast Forum. Didn’t see what you expected? They’re working on new lists, so check back soon and register to join the newsletter. Or make a recommendation – they’re eager to capture what’s relevant to the consumers, stakeholders and policy makers in hopes of sparking conversation.